The rule is the same as the Spider Solitaire of Windows. 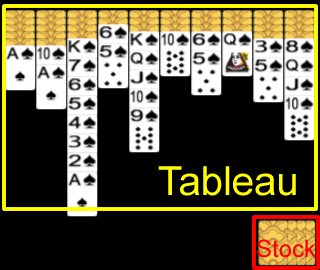 If from 13 of the same suit as tableau to 1 is put in order, a card will disappear. It will be complete if all the cards are lost from a place card. When it becomes impossible to move a card, it can deal from Stock. In addition -- suit which is different in the case of the middle class (two suit(s)) of difficulty, and an upper class (four suit(s)) -- 1 -- although few cards can be put on the bottom of a card, the movement can do only the card in which the same suit continues.